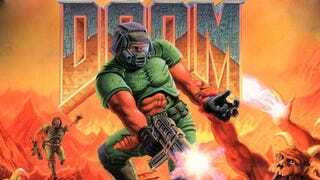 This old John Romero home movie is worth watching if you've not seen it before as it shows that id blew their own tiny little minds playing DOOM. It's a 1993 home movie first posted by Romero about five years ago recording a studio tour, including 20 minutes of unfinished DOOM complete with the wrong sound effects, bugs and incomplete art. The most amazing part is hearing all the 'wow's and 'oh my God's at such groundbreaking features as 'changing lights' or 'being able to see outside'. It shows you just how far we've come when one guy can't get his head around the idea that an enemy is shooting at you through a window from another building. "In 1993, Dan Linton, owner of a hugely successful BBS called Software Creations, visited Texas and made his way to id Software. This is the footage he recorded one night in November 1993.